You leave a pen on your laptop keyboard, close the screen and CRUNCH! No need to panic, we stock replacement laptop screens for most makes of laptop and can have your broken laptop screen repaired in no time at all. Screen repairs start from only £80 including parts and labour. So, whether you’ve put your foot through your laptop screen, or knocked it off the table and are wondering why your laptop screen looks like it is leaking then give us a call, we’ll have that broken laptop screen replaced in no time and you won’t know the difference. Broken laptop screens can’t be fixed but they can be replaced. We stock the full range of replacement laptop screens including glossy laptop screens, matte laptop screens and LED backlit laptop screens. 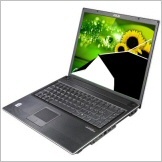 We replace screens in Dell laptops, Acer Laptops, HP Laptops. We can fix your broken laptop screen even if your laptop is not built by a well know manufacturer. We cater for all makes of laptop so give us a call and get it repaired. If your computer feels like it’s stuck in the mud and takes an age to do anything then you probably have some kind of infection. Virus and spyware infections are on the increase. It’s so easy nowadays to visit a website and pick up and infection without even noticing. We can help! For a fixed price of just £55 we’ll get your laptop cleaned and freshened up. All viruses removed, your security software audited and your machine running like it’s brand new again. We are experienced in removing the most stubborn computer infections, a laptop virus is easy to get but can be very difficult to remove. You can pick up a computer virus just by browsing some websites. There you are minding your own business looking for free music when suddenly you get a warning on your screen saying your computer is infected and a message that says click here to clean your machine, Next thing you know, the program wants to charge you to remove the infection. STOP! Never pay anyone that you haven’t previously agreed to pay, if you get any of these virus warning messages on your laptop then give us a call. The money you save by not giving your card details away will pay for the repair. 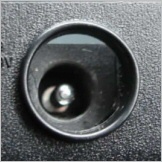 A broken power connector or broken power socket is a common problem with laptops. We have the necessary tools and experience required to fix a broken laptop socket, we stock replacment DC sockets for most makes of laptop and can normally have your laptop socket repaired in just a few days. The cost of a DC socket repair on most laptops is only £85.Students and OAPs get a discounted price of just £75. Some laptops sockets such as Sony may require a complete replacement DC socket assembly and may cost more but we will inform you of any extra cost before we undertake any work. Please call for a quote for repairing your broken laptop socket. If you have a laptop with a broken power connector but don’t want the expense of repairing the broken laptop socket then why not give us a call, we buy used laptops and can offer you a good price for your used laptop. Rocket Repairs Southampton Computer Services have nearly 20 years experience fixing computers, we can resolve just about any laptop problem. 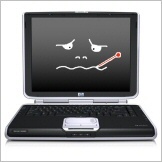 We repair laptops for a fixed fee of just £55! We work on a real no fix no fee basis, we’ll tell you how much it will cost before we do any work, so you don’t get any unexpected surprises..
Bring your laptop in to our workshop in Southampton and allow our engineers to diagnose the problem, we’ll then tell you exactly how much it is going to cost to repair your broken laptop. If your laptop needs a new hard disk then we can supply and install a new hard drive no problem. Our service doesn’t end there! We’ll also re-install Windows and all the system drivers at the same time. We’ll make sure that your Windows software is up to date and completely ready to use. Most importantly, we’ll copy any surviving data across to the new hard drive at no extra cost. We replace laptop screens on a regular basis. If you have managed to break your laptop screen then don’t worry. We supply replacement laptop screens for all makes of laptop. We supply replacement laptop screens for Dell, Evesham, HP, Compaq, Acer, IBM, Novatech, and a whole lot more. Please give us a call so that we can provide a quotation for your replacement laptop screen. We provide replacement laptop screens from as little as £99. We replace broken laptop power sockets for all makes of laptop, if your power connector is loose then don’t take a chance on further damaging your laptop with a short circuit. We also offer part-exchange discounts on new computer systems. If your laptop is beyond economical repair then we can provide you a discount off a new computer system in exchange for your old broken laptop. Our laptop repair service is great value, we fix all makes and models of laptop and notebook computer systems. I dropped my laptop, the screen is OK but nothing happens when I switch it on. How much is it going to cost? It sounds like your hard disk drive might be damaged and now unreadable. We’ll replace the hard disk drive, re-install your software and copy any surviving documents from your old hard disk drive. All this for just £99. For a quality laptop repairs in Southampton just give us a call on 02380 003210.